It is amazing how many things you can carry on either in the vest of jacket from SCOTTeVEST. It is like having extra carry on bags. You can carry all your valuables by loading them in these bags. No need to take out everything every time you go through the security screening at the airports. 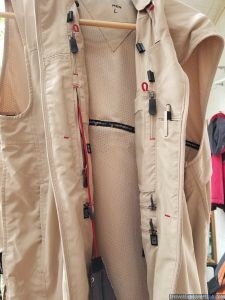 Simply send the vest or jacket through for screening. This way you will not lose your personal valuables when you are experiencing jet lag and have to go through for security screening. 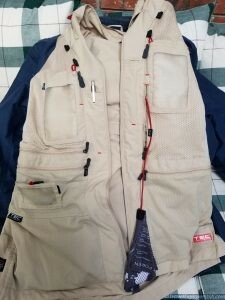 The SCOTTeVEST Jacket has many hidden pockets as well. It also will keep you warm on flight. It is comfortable to wear and looks smart. 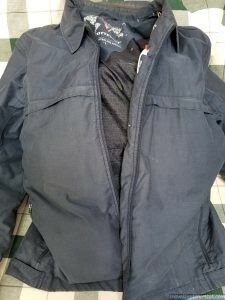 Anti-Theft SCOTTeVEST Blue Jacket for Travel has many hidden pockets to keep your valuables safe. You can even store your tablet inside this jacket. 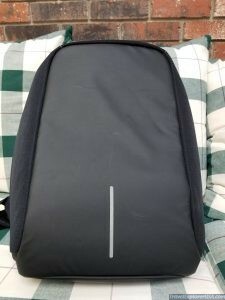 This is an amazing backpack that is designed with zippers on the insides. 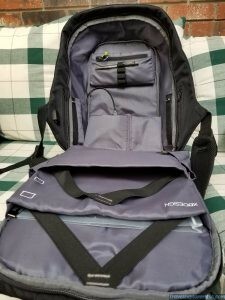 So when you carry this backpack, there are no exposed zippers on the outside that someone can easily unzip and get into your stuff (for an example in a train, elevator or subway or some other crowded place). The zippers are hidden on the inside. There are also small hidden side pockets to keep small stuff for quick access. There is even a pocket on the harness for your train tickets etc. Nice clean look with reflector. Notice you cannot find any zippers on the outside. 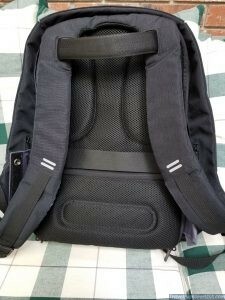 The bag is neatly organized with separate slots for laptop, electronics etc and also has hidden pockets. You can connect your phone to an external built-in plugin. The plugin is then wired internally so you can connect it to your battery safe inside your backpack. If you work and travel, you will need tech gadgets to stay connected to your office and still have fun. 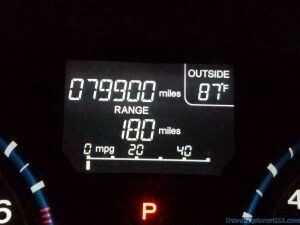 While a speedometer will let you know how many miles you have travelled (if you are driving), you may be completely jetlagged while flying. 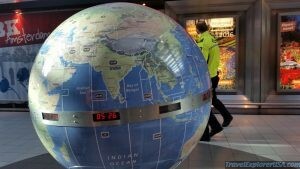 You may not even know what time zone you are in or what time it is at your destination. A good smartphone is a must. It is almost impossible to go anywhere without a mobile or cell phone. Since it is quite expensive to call from abroad, we recommend purchasing local sim cards in the country you are travelling to. Problem is most US phones do not work overseas. You will need a GSM phone like from AT&T or T-Mobile unlocked. GSM phones work well when travelling to international destinations as it will take their local sim cards. Standard Sprint PCS and Verizon Cdma do not use GSM technology. If you have a Mobile VoIP App (Voice Over IP or Internet App), you can get your voice mail (as an audio attachment) in your email on your smartphone even when you are abroad. You can get virtual local phone numbers that you can answer live over the Internet while travelling. For an example, you can have your family call you on their local number (say in San Francisco, USA), which you can answer while you are in London. It will be a local free call for your family. You will need to have access to the internet via Wi-Fi or local mobile data from your local in country phone company. This really opens up world travel. You can also use apps like WhatsApp (now owned by Facebook) , Skype (now owned by Microsoft), Google Hangouts etc. The neat thing about your own mobile app is you can even program or filter which calls you wish to answer and send the rest to voice mail. If you run the mobile app via your corporate or work VPN or Private VPN, you can have better encryption and privacy. So, you’ve heard about VoIP (Voice-over IP), and you want to run your office from the cloud while on the road? Fortunately, that’s where Globalink Inc comes in. We believe that your customer should stay just that…your customer. That’s why we offer private branding of our VoIP services, so that your customer only knows you. We take care of the back-end technical server stuff, so that you can focus on managing your customers or your employees. We can help you learn what you need to know and manage your office in the cloud. You can manage everything right from the internet web browser and use our mobile app. You can travel and take the office on the road!